Just updating you all from Cameron Highlands, enjoying a cup of the best Malaysian Boh Tea on a cool terrace in front of the hotel guest's computer of the Cameron Highlands Resort. I booked an all inclusive package which means that you can eat in the hotel. This is a must because eating outdoors in Cameron Highlands meaning you will have to share your food with the flies. Cameron Highlands is Malaysia's and Singapore's vegetable garden, lots of chicken and cow dung is used, attracting more flies than tourists. The meals in the Cameron Highlands Resort are quite pricey, but it beats having to eat with one hand whilst the other is trying to wave the flies away. 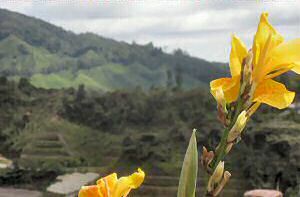 I am in the midst of making a small website about all things to do in Cameron Highlands Malaysia, so go and have a look there for more info about hotels, activities and restaurants.